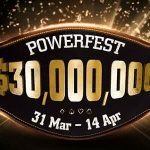 Party Poker´s $5,000,000 guaranteed Powerfest series gets underway this coming Sunday with a unique structure that should appeal to all tournament players. 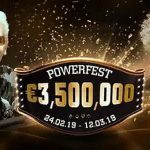 Powerfest is the new name for Party Poker´s previously successful Pokerfest tournament series – the name having been changed to compliment the weekly Power Series tournament schedule that has been running at Party Poker since last November. The change of name is not the only thing that is different about the series. More events have been added, the series guarantee has been doubled to $5 million and a tiered structure of buy-ins has been introduced over the four weeks of top grade action. Also new to the series is a Tournament of Champions. 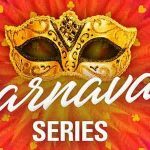 This will involve the winners of the ninety-eight Powerfest events facing off against each other in a special tournament that will award the winner the trip of a lifetime to Las Vegas in the summer. The tournaments within the four weeks of the Powerfest series have been divided into four separate categories – “Featherweight”, “Middleweight”, Heavyweight” and “High Roller” – with each category being allocated a range of buy-ins. Featherweight Week runs from Sunday 21st February to Sunday 28th February with all buy-ins ranging from $5.50 to $11.00. Middleweight Week starts on Sunday 28th February, when the tournament buy-ins range between $22.00 and $55.00. Heavyweight Week gets underway on Sunday 6th March and will include events with buy-ins ranging from $109.00 to $215.00. High Roller Week begins on Sunday 13th March and will feature Powerfest tournaments with buy-ins of $530.00 and upwards. Each week will also have its Main Event on the concluding Sunday. 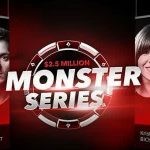 The Main Events have buy-ins equivalent to the top end of that week´s range, with the exception of the High Roller Week Main Event that has a buy-in of $1,050. Satellites are already in full flow for the higher buy-in Powerfest tournaments, and Party Poker is hosting a special “Missions” promotion throughout the series, in which any player who competes in three of one week´s tournaments automatically receives a ticket to one of the following week´s events. The winners of each Powerfest tournament will automatically win a seat in the Powerfest Tournament of Champions that takes place on Sunday 28th March. Up for grabs in the Tournament of Champions is a $5,000 prize package that includes flights and five nights’ accommodation for two in Las Vegas and entry into the WPT500 at The Aria. I love that Party Poker is introducing the Tournament of Champions element into the new Powerfest. This allows all the winners of each buy-in level to compete for their chance to win the memory of a lifetime. I look forward to hosting the winners in Vegas this summer. 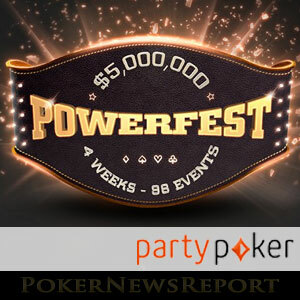 Full details of the Powerfest schedule appear on the Party Poker website; but, if you are not already playing at Party Poker, PokerNewsReport has a very special offer for you. Simply register for an account and make your first deposit using the Party Poker bonus code “PNREPORT” to get a 100% bonus on your first deposit of up to $500.00. This offer is not available directly through the Party Poker website and details of how to clear the bonus appear on our dedicated Party Poker bonus code page. The entry fees you pay for entering any of the Powerfest tournament also count towards the bonus clearance requirements, so make sure you register for an account in time for the start of the Powerfest series this coming Sunday.